I hadn’t been to Santorini since 1978, a whopping 37 years ago. I remembered it being a sleepy place with not much going on: a few shops in Fira and Oia, a handful of hotels. Today, it is unrecognizable to me. These two towns are now jammed with tourists, shops, hotels and restaurants. It appears that the $5 rooms offered by homeowners to travelers just off the boat from Piraeus are long gone, replaced by all manner of fancier accommodations. And the traffic: unbelievable! The roads are a jumble of tiny streets, pedestrians darting out with no warning, ATVs moving slowly, buses traveling at breakneck speed, vehicles going in opposite directions eking by each other in order not to crash. Not to mention driving an unfamiliar car with standard transmission. And this was supposed to be the relaxing part of the trip! and the ground itself is comprised of various sized red gravel and what appears to be sawdust or mulch. Shortly after a swim in the Aegean (from which we emerge covered in bits of sawdust), we depart for Perissa. 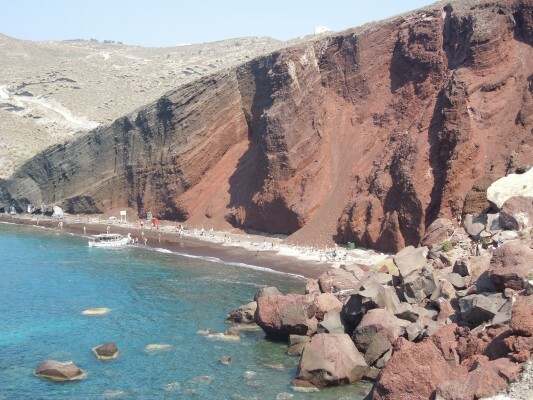 It is a very long beach of black volcanic rock worn to small round pebbles that exfoliate and massage your feet simultaneously, a delicious experience. Here the Aegean Sea is sublime, a beautiful clear azure and perfectly temperate, my kind of swimming conditions! 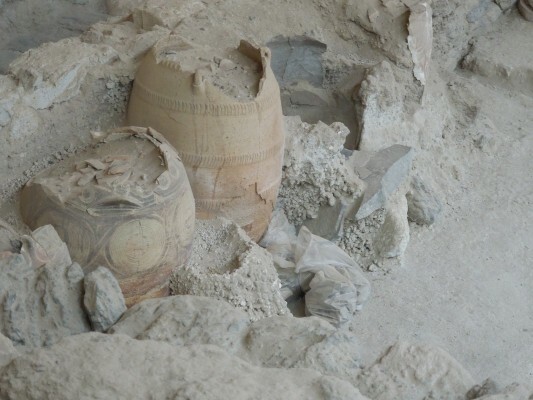 On another day, we visit Akrotiri, a recently excavated ancient community that was destroyed by earthquake and volcanoes several times since its founding, finally being buried in ash and abandoned centuries ago. At its most populous, there were 30,000 inhabitants and it is historically unclear whether they fled before the last eruption or died as a result of it. We go to the highest spot on the island, a monastery that is remote and quiet and is a fantastic viewpoint for sunset. 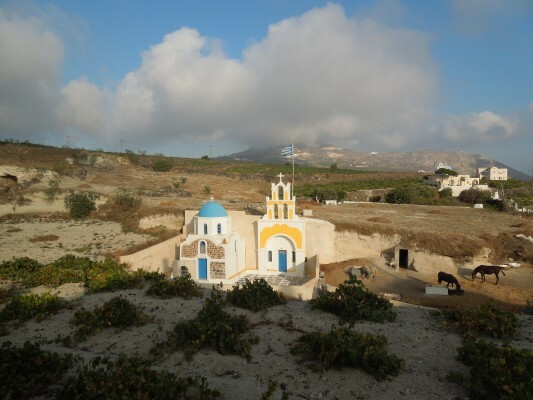 Travels to the villages of Pyrgos and Meligachori (where we stay) feel like the more authentic Greece with far fewer tourists and a much more leisurely pace. And so a wonderful ending to this adventure.